The metaphorical guest book of the Hotel des Indes certainly rivals any other in The Netherlands. After all, here have stayed the likes of Mata Hari, Emperor Haile Selassie, Empress Eugenie of France, and Josephine Baker. However, its main historic significance is that it was where the iconic ballet dancer Anna Pavlova passed away following pneumonia on January 23rd 1931. The hotel’s lounge is named in her honour. 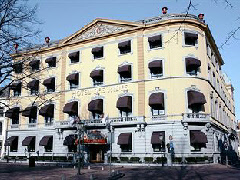 Originally a palace, the building has been welcoming visitors since 1881. Five-star rated, it boasts a health club and swimming pool, restaurant, and is noted for its ‘High Tea’ served between 2 and 5 pm.